Although wood includes fire in the sense that it has the potential to burn, a piece of wood will ever remain dull wood, no matter how dry or inflammable it might be, unless it contacts fire. Similarly, each one of us needs to make contact with someone who is, so to speak, on fire with divine consciousness, or Krishna consciousness, so that our spiritual potential may be realized. Another Vedic analogy says that just as a fertile woman must receive help from a man to conceive a child, any person, no matter how qualified, must receive the seed of spiritual life from Lord Krishna’s pure devotee. From that seed grows the plant of devotion to Krishna. You might wonder where to find “pure devotees” and if you could ever be an ordinary devotee, what to speak of a pure one. Of course, it is highly desirable to associate with advanced devotees. But, like me, you might live away from devotees in the Krishna consciousness movement. So what can we do to get regular Krishna conscious association? The two verses cited above can still apply to us, when we consider that the term pure devotee can refer either to the most elevated devotee or to a neophyte sincerely trying to become a devotee. Srila Prabhupada once said that all his disciples were pure devotees. 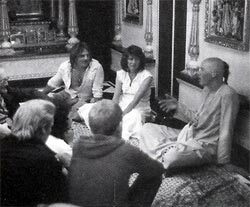 We can find other people in our area who are interested in practicing Krishna consciousness and associate with them. We can meet together and apply the principles Srila Rupa Goswami outlines as the six symptoms of love shared by one devotee and another: giving and receiving gifts, revealing one’s mind in confidence and inquiring confidentially, and offering and receiving prasadam, food offered to Krishna. We can hold meetings in one another’s homes, chant Hare Krishna, worship the Lord, share prasadam, read and discuss the Vedic scriptures, share with one another our efforts to practice spiritual life, and perhaps plan how we can help spread Krishna consciousness. Because regulation is essential to the practice of Krishna consciousness, we should try to meet regularly with other aspiring devotees of Krishna. Out of vaidhi bhakti, or regulated devotional practice, grows raganuga bhakti, spontaneous devotional practice, which can mature into pure love for Krishna.